Handsome Regal had no ego. He would give up his water, food or even crate if another pet wanted it. A complete gentle, compliant sweetheart. It happened the first time at 10 am on a Sunday morning. I’d only had him a few weeks. I had parked at the Quaker Meeting House on Goshen Road in Willistown. I opened the back door of the car to catch leashes for a short walk before meeting. Suddenly, my shy dog bolted past me and shot off, leash flapping, into the woods. Starbright, his pomeranian/husky mix “big sister” went ballistic, screaming for him to come back. We followed him into the woods. He shot down the slope, zig-zagged across Goshen Road twice, then charged toward us. He ran several circles around us doing the “Nah, nah, nah, nah, nah” laps. Then he vanished into the skunk cabbage and briars of the swamp. No way to even track him. Later that morning Pat brought Lady to try to track him. 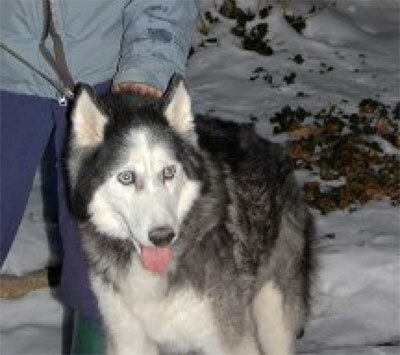 We fought through woods and across lawns, knocking on doors to ask if anyone had seen a black and white husky. Nope. The trail ended at Delchester Road. There was nothing to do but hope. I called the local vets, shelters and the Department of Transportation, but there wasn’t much response on a Sunday. He was wearing his collar and he was micro-chipped, but the trailing leash could tangle on anything, and Regal had no respect for roads. Monday came. Still no news, despite more calls. The day dragged on. Starbright and I couldn’t eat. A little after six, I got a call. It was a veterinary hospital in West Chester. At about 4:30 pm a young woman driving west on her way to work at that vet noticed the traffic on Route 3, heavy at rush hour, had stopped. Craning her neck, she realized drivers were trying to avoid an exhausted husky staggering back and forth across the road. When he got on the grass on the right side, she maneuvered her SUV up on the shoulder and herded him farther off the road. Another woman pulled off behind her, having witnessed the whole event. They both tried to cajole the panicked dog to come close enough to grab his leash, but he barked fearfully, and backed away. The second driver then suggested the dog could probably be lured with food, and drove off to Burger King. Sure enough, a trail of burgers later, Regal was safely in the SUV! At West Chester Vet Hospital, they found my number and called me. What joy! The wonderful young woman even drove him home, all the way to Bryn Mawr, to see him reunited with his family. Regal was home, all four feet bleeding, and covered with (47) ticks. Starbright danced around him, nuzzling and chortling with delight. Regal was too exhausted to move while the ticks were removed, the feet cleaned and he was powdered with insecticide. But did he learn??? Just loosen my grip on his leash and… it couldn’t happen, a husky’s ways never change. After 13 wonderful years with Starbright and me, Regal crossed the Rainbow Bridge, age 15? 16? 17? I know he is running free with the pack. Dance among the stars and play, young and pain free now. You have earned your silver harness my friend, wear it proudly. Watch over Nan and Starbright ~ you are their fur-angel now.